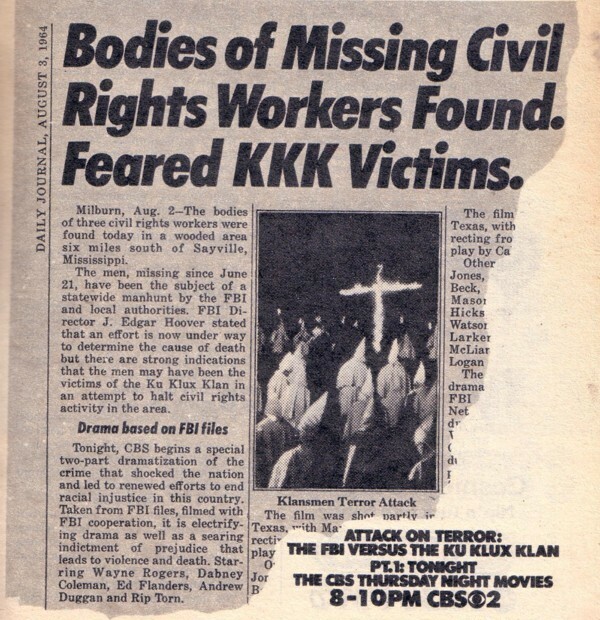 Part 1: About the FBI's investigation into the Mississippi murders of three civil-rights workers, allegedly at the hands of the Ku Klux Klan. Part 2: About the arrests and trial of Ku Klux Klan members suspected of murdering three civil-rights workers in rural Mississippi. Starring: Dabney Coleman, Rip Torn, Andrew Duggan, Ned Beatty, Peter Strauss, Wayne Rogers. Summary: Three handicapped men decide to improve their luck by planning a complex museum robbery. Starring: Mike Connors, Michael Cole, Kent McCord, Henry Beckman, Russell Johnson, Logan Ramsey. Note: Extremely rare film. First 10 to 15 minutes there is dropout, then film settles down. Summary: Susan Dey stars as a teenager who faces the horrors of a poorly run penal institution after being mistakenly convicted of murder. Filmed in part at the Las Palmas School for Girls, City of Commerce, Cal. Summary: Set in the 21st century, the film concentrates on a group of colonists dwelling in a modernistic underwater city called Pacifica. The deep-sea denizens struggle to cope with the pressures of their new existence--and their own personal animosities. Produced by Irwin Allen (Lost in Space, Land of the Giants, Time Tunnel), this movie was a pilot for a series that never materialized. Starring: Stuart Whitman, James Darren, Robert Colbert, Richard Basehart, Whit Bissell. Summary: An intelligence agent is assigned to prevent a ruthless spy from stealing a formula for a deadly gas. Filmed in Hawaii. 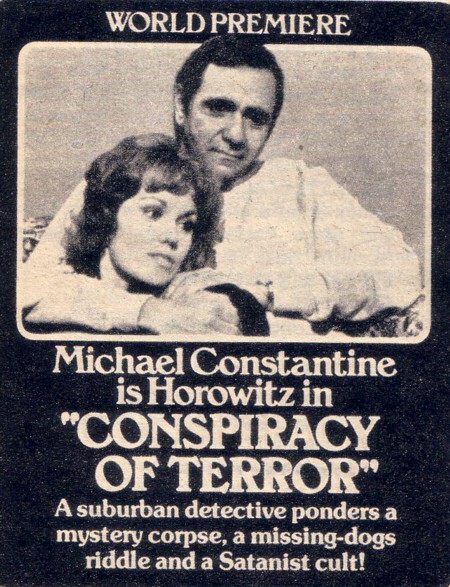 Produced by Quinn Martin (FBI, Invaders, Barnaby Jones, Cannon, Streets of San Francisco...), this was a pilot for a series that never materialized. 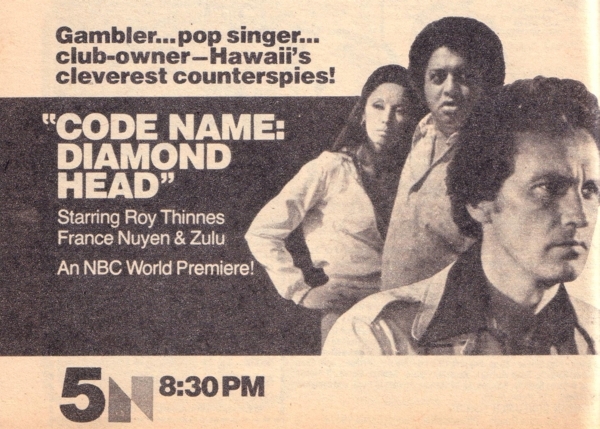 Starring: Roy Thennes, France Nuyen, Zulu, Don Knight, Eric Braeden. Summary:About the cases and complications in the lives of husband-and-wife police detectives Jacob and Helen Horowitz. Pilot for a series that never materialized. 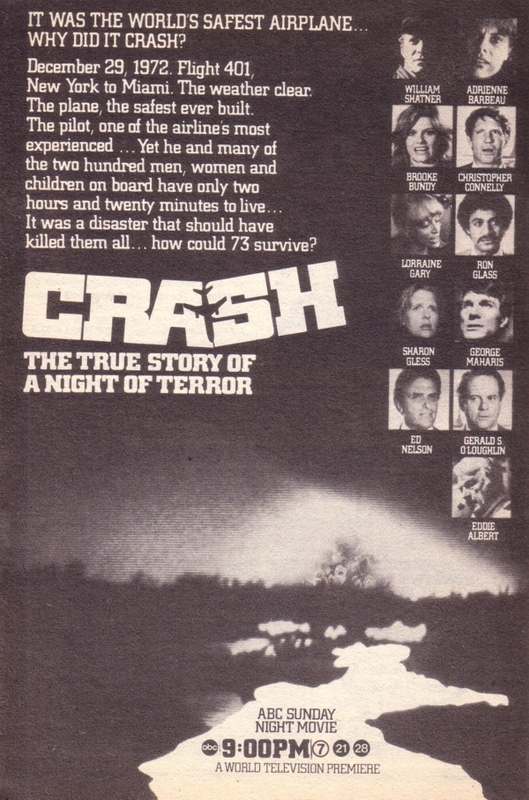 Summary: Realistically filmed, "Crash" reconstructs an aircraft disaster: the 1972 downing of a commercial jet in the Florida Evergaldes. Some scenes and characters in this 1978 TV-movie have been fictionalized. 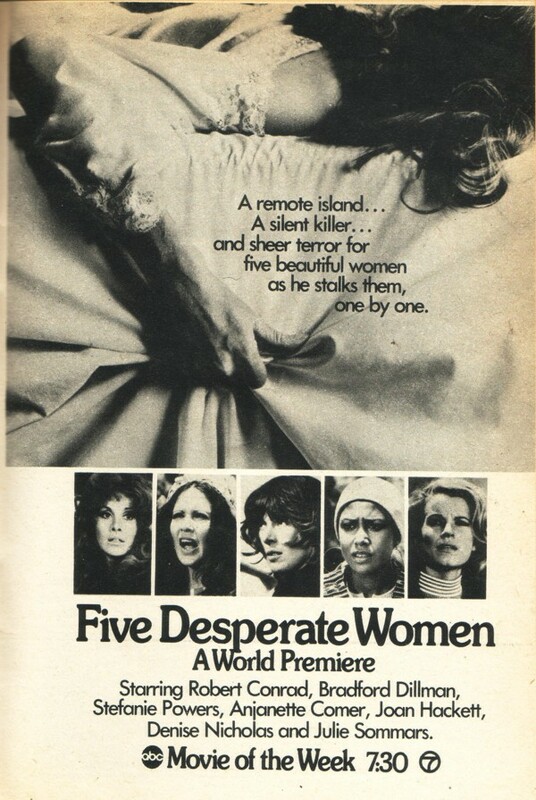 Starring: William Shatner, Eddie Albert, Adrienne Barbeau, George Maharis, Ed Nelson, Gerald S. O'Loughlin, Christopher Connelly, Brooke Bundy. Summary: An Egyptian sarcophagus that is cargo on a pleasure cruise ship has a secret - it contains the son of Satan, and its effects start to make the ship's passengers behave strangely. Starring: Dirk Benedict, Frank Converse, John Forsythe, Christopher George, Lynda Day George, Jo Ann Harris, Lee Meriwether, Hugh O'Brian, Ray Milland. Summary: Backpackers are besieged by forest animals made beserk by depletion of the ozone. Starring: Christopher George, Leslie Nielsen, Lynda Day George, Michael Ansara. 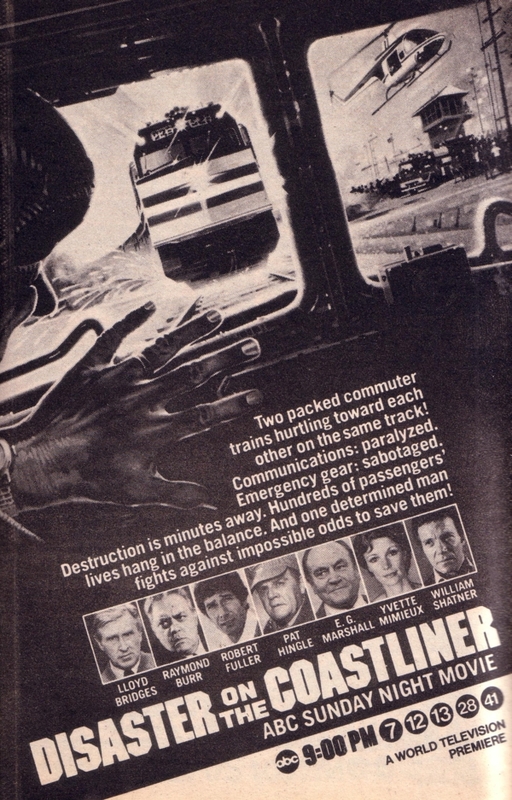 Summary: A deranged man plots a full-speed, head-on collision between two passenger trains. Starring: Paul Smith, Lloyd Bridges, E.G. Marshall, William Shatner, Raymond Burr, Pat Hingle, Robert Fuller. Summary: Sparks fly when a liberated woman doctor agrees to share an apartment with a cop she considers a sexual bigot. Jerry Paris directed the film in San Francisco. Starring: Barbara Eden, David Hartman, Juliew Newmar, Farrah Fawcett, Harry Morgan. Summary: A psychopathic killer transforms a class reunion into a weekend of terror. Exteriors filmed at Santa Catalina, Cal. Summary: "The Horror at 37,000 Feet" is an unseen force in a 747's cargo hold that is emitting strange voices, freezing cold - and an unearthly head wind holding the plane motionless in the sky. Starring: William Shatner, Roy Thinnes, Chuck Connors, Lynn Loring, Buddy Ebsen. Summary: An iron-willed matriarch who dominates a family of California winegrowers also has a strange power over a colony of bees that thrive in the vineyard. 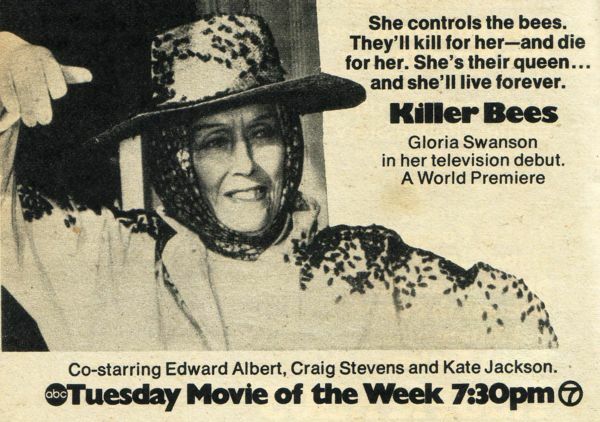 Starring: Gloria Swanson, Edward Albert, Kate Jackson, Craig Stevens. Summary: The Navy hires Honolulu-based underwater salvagers to find a missing Soviet submarine. Jack Lord's last work as actor and director. Pilot for a series that was not picked up. Starring: Jared Martin, Jo Ann Harris, Andrew Duggan, Dana Wynter. .
Summary: During a New York City blackout a crime spree runs unchecked throughout the darkened metropolis as the Mayor tries to stem the tide of robberies and rapes, even as he labors to becalm the panicky citizens. Starring: Raymond Burr, Robert Culp, David Cassidy, Georg Stanford Brown, Don Meredith, Linda Purl. Summary: Those who run a large metropolitan airport handle several crises on the job. Starring: Pernell Roberts, Clu Gulager, Beth Brickell, Van Johnson. Summary: An incompetent Vice President is in control of the government after the President's plane mysteriously disappears with him on board. Starring: Buddy Ebsen, Peter Graves, Dabney Colemna, Arthur Kennedy, Raymond Massey, Rip Torn. 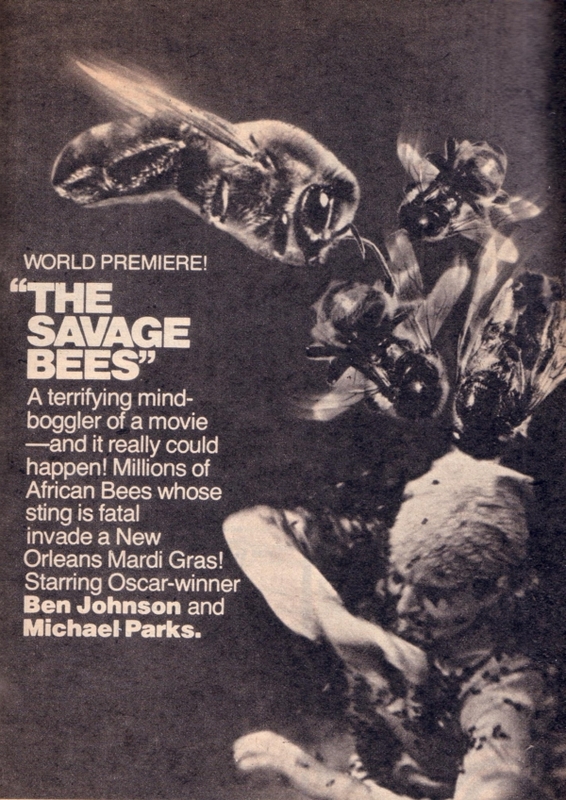 Summary: A swarm of killer bees hover near New Orleans only days before Mardi Gras. Starring: Ben Johnson, Michael Parks, Gretchen Corbett, James Best. Summary: People trapped in a New York subway after an earthquake try to find their way out. Starring: James Brolin, Don Mitchell, Brooke Bundy, James McEachin. Summary: A Los Angeles-bound commercial airliner is hijacked to Russia by an unknown miscreant. Even when the skyjacker is subsequently subdued, the crew must contend with a hidden time bomb. Starring: Charlton Heston, James Brolin, Yvette Mimieux, Susan Dey. Summary: A look at the tangled lives of people involved in a massive - and realistically staged - chain collision. Summary: A made-for-tv fantasy-drama. The discovery of a World War II bomber in the Libyan desert prompts an Air Force investigation. The plane's navigator and sole survivor disobeyed orders and bailed out; now, the ghosts of the dead crewmen stand by, awaiting the navigator's exposure. 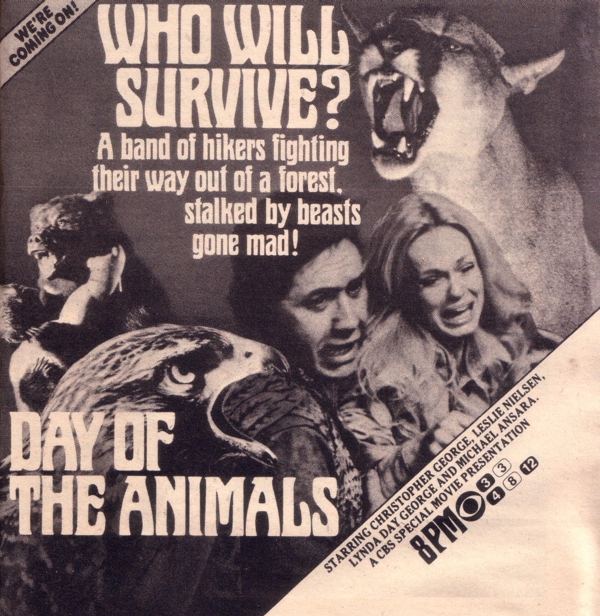 This was CBS's first made-for-tv movie. Summary: A complex kidnap drama involving not one victim but three - and an unknown mastermind who's thought of everything. Location scenes include parts of San Pedro, Cal. Summary: A band of dune-buggy-riding malefactors are set on turning an innocent family's camping trip into a holiday of horror. Filmed on the sand dunes around Pismo Beach, Cal. 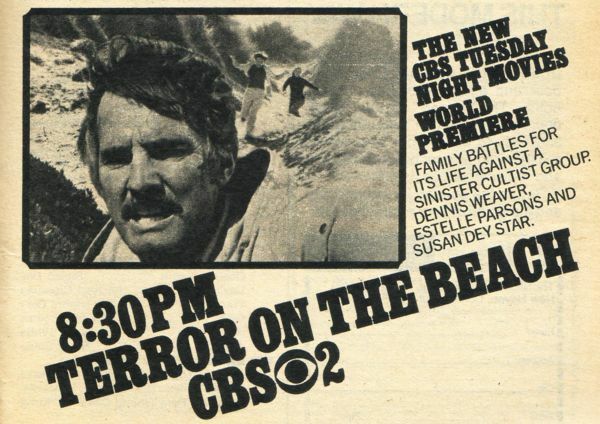 Starring: Dennis Weaver, Estelle Parsons, Susan Day, Scott Hylands, Michael Christian. Summary: A terrified man is locked in a department store and fighting for his life against against ferocious guard dogs trained to kill. Summary: In a routine homicide case, the defense pleads temporary insanity. Prosecutor Logan is inclined to agree - until the size of a shotgun pellet points toward premeditated murder. Produced by Quinn Martin as a pilot for a series that never materialized - too bad. Starring: Vic Morrow, Hal Holbrook, Brooke Bundy, James Callahan, Scott Marlowe. Summary: A superhuman woman uses her powers to stalk an elusive espionage agent.